Inelastic demand in economics is when people buy about the same amount whether the price drops or rises. That happens with things people must have, like gasoline. Drivers must purchase the same amount even when the price increases. Likewise, they don't buy much more even if the price drops. Elastic demand: When changes in price impact the quantity demanded. Unit elastic demand: When changes in price cause an equal change in demand. You calculate demand elasticity by dividing the percentage change in the quantity demanded by the percentage change in the price. For example, if the quantity demanded changes in the same percentage as the price does, the ratio would be one. If the price dropped 10 percent and the quantity demanded increased 10 percent, then the ratio would be 0.1/0.1 = 1. The Law of Demand says that the amount purchased moves inversely to price. You can ignore the plus and minus signs. That ratio of one is called unit elastic. Elastic demand is when the quantity to price ratio is more than one. If the price dropped 10 percent and the amount demanded rose 50 percent, then the ratio would be 0.5/0.1 = 5. At the other extreme, if the price dropped 10 percent and the quantity demanded didn't change, then the ratio would be 0/0.1 = 0. That is known as being perfectly inelastic. 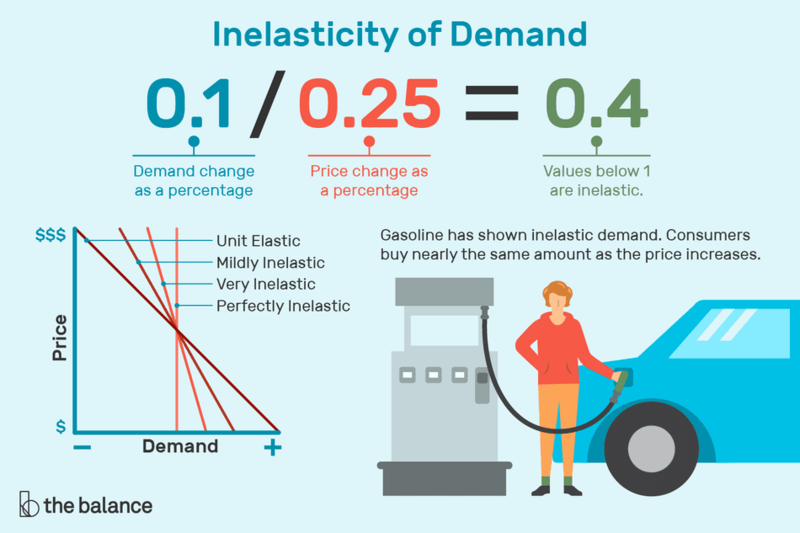 Inelastic demand occurs when the ratio of quantity demanded to price is between zero, perfectly inelastic, and one, unit elastic. For example, beef prices in 2014 rose 28 percent, but demand only fell 14.9 percent. This revealed that the demand for beef was fairly inelastic. The demand schedule for beef shows a genuine example of how real life factors affected beef’s demand in 2014. You can also tell whether the demand for something is inelastic by looking at the demand curve. Since the quantity demanded doesn't change as much as the price, it will look steep. In fact, it will be any curve that is steeper than the unit elastic curve, which is diagonal. The more inelastic the demand, the steeper the curve. If it's perfectly inelastic, then it will be a vertical line. The quantity demanded won't budge, no matter what the price is. That's shown in the chart below. Five factors determine the demand for each individual. They are price, the price of alternatives, income, tastes, and expectations. For aggregate demand, the sixth determinant is the number of buyers. The demand curve shows how the quantity changes in response to price. If one of the other determinants changes, it will shift the entire demand curve. More or less of that good or service will be demanded, even though the price remains the same. There is no example in real life of something with perfectly inelastic demand. If that were the case, then the supplier could charge an infinite amount, and people would have to buy it. The only thing that would come close would be if someone managed to own all the air or all the water on earth. There is no substitute for either. People must have air and water or they'd die in a short period. Even that's not perfectly inelastic. The supplier couldn't charge 100 percent of the income in the world. People would still need some money for food or they'd starve within a few weeks. It's hard to imagine a situation that would create perfect inelastic demand. But some products come close. For example, gasoline is something that drivers need a certain amount of each week. Gas prices change every day. If there is a drop in supply, the prices will skyrocket. That's what happened during the OPEC oil embargo in 1973 when the Organization of the Petroleum Exporting Countries stopped oil exports to the United States. People will still buy gas because they can't immediately change their driving habits. To shorten their commute time, they'd need to change jobs. They'd still need to get groceries at least weekly. They could go to a store that's closer, if possible. But most people would tolerate higher gas prices before they would make such drastic changes. You can see how that would cause demand-pull inflation.